Dragon Farm is a purpose built facility to breed Reptiles and Amphibians. It is run by Mark Harris. I am based in Central Portugal, in South Western Europe. My aim is to supply species that are not as common in captivity as maybe they should be. I have chosen species that adapt well to captivity. I hope by supplying some of the more unusual, less commonly seen species in collections, I will encourage people to buy my animals bred in captivity, rather than wild caught ones. I believe that generally wild caught reptiles make poor pets. Also of course any 'harvest' from the wild may impact badly on species which are already under a lot of pressure from negative human activities. I had the idea of moving from London to Portugal to breed reptiles in 2004. The search started then to find the ideal location. In November 2005 I sold our old house, and swapped it for a small farm in the central part of Portugal. My interest in Reptiles and Amphibians had started when I was a seven-year-old boy. I loved growing on Common Frog tadpoles in old aquaria in the garden. A few years later I had an Edible Frog, some Firebellied Newts, a Green Toad and a Garter Snake as pets. A little later around the age of 16 I had my first outdoor vivarium devoted to Pool Frogs in the garden. Very early on I saw many advantages of keeping reptiles and amphibians outdoors. The Pool Frog cage was made from an adapted garden coldframe. The glass panels were removed and mesh fixed in its place. The frogs got to bask in the sunshine, and got rained on, without the aid of expensive ultraviolet light emitting lamps, or mister systems. The coldframe never needed cleaning out. Earthworms and woodlice broke dowm all the waste matter, and that broken down waste fed the plants. By now I was hooked for life, fascinated by these animals. He was the first to breed Morio worms (Zoophobas morio) as a live food for reptiles. 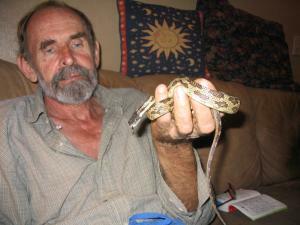 He pioneered the methods of breeding them on a large scale, making them available to other reptile keepers. he was the first to make available many species of reptile that at the time either extremely rare or unavailable to hobbyists. For example it's unlikely that any Australian Water Dragons would exist (outside of zoos), in Europe or the USA if it were not for him breeding them. he pioneered the breeding of species such as Argentine Black and White Tegus, that others had failed to breed. Not only that but he wrote many articles and books helping others to keep and breed these species. In 1990 I went to see Bert present a lecture at one of these British Herpetological Society meetings. He did a slide show about 'Agama International', his new reptile breeding facility in the US state of Alabama. I was amazed and fascinated by what he was doing. He is definitely a hugely inspirational figure for me in the world of herpetoculture. I made great efforts to try to get hold of any articles that he had written. In 2007, two years before his untimely death, I was lucky enough to spend a week on his farm with him and his wife Hester. It is a time I will never forget, and it was an honour to meet the great man before before he died. These are people I would like to publicly thank for their invaluable support, advice and ideas ( in alphabetical order). Chris Mattison (for the first decent reptile books that I read as a teenager).